Input-Output databases are based on national economic and environmental statistics. These databases have the advantage over process-databases that they cover the complete economy eliminating the need for making cut-offs in the LCA. Databases for LCA that are based on national economic and environmental statistics are known as “Input-Output databases” or “IO-databases” for short. A number of IO-databases for LCA based on national economic and environmental statistics are now available in SimaPro format. The main advantage of the IO-databases is that one does not have to make cut-offs, i.e. to exclude parts of the product system. Another advantage is their consistency in terms of the way data are collected. Since data are collected for the same environmental exchanges and in the same way consistently for all processes in the economy, you avoid problems of inconsistency and false results, i.e. that a process shows up as important because data on a specific substance emission is available for that specific process, while it is not available for the other processes. The disadvantage of IO-databases for LCA is that processes are relatively aggregated, i.e. at the level of product groups rather than individual products. However, this disadvantage can be overcome by the use of hybrid analysis, see below. 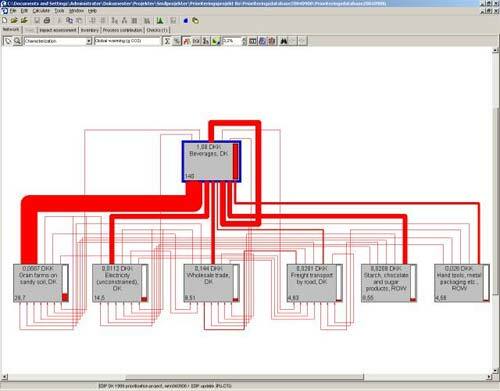 The IO-database for USA 2002 is available as a part of the standard database that comes with the SimaPro software. The documentation of this database can be found in Suh S. (2003). MIET 3.0 user’s guide. Amersfoort: PRé consultants (referring to the 1998 version). The IO-database for EU27 and Denmark 2003 is available as a part of the standard database that comes with the SimaPro software. 750 commodities covering the entire Danish economy and EU27. The IO-models are developed by 2.-0 LCA consultants as part of the EU FP6 project FORWAST. The data in the DK IO-model relating to agricultural activities in economy has been further validated and improved through a project ‘Pilot project – assessment of the effect of research‘ funded by the Danish Ministry of Food, Agriculture and Fishery. The IO-model is a hybrid unit IO-model based on complete balanced monetary and physical supply-use tables. The fact that the model is in hybrid units enables one to operate with different prices over activities, e.g. energy intensive industries such as electricity generation and production of basic metals often pay less for fuels than other activities. The implication of this is that traditional IO-models often underestimate the use of fuels and electricity for energy intensive activities. The model includes generation and treatment of wastes in physical units. The model distinguishes between virgin production of material and recycling of waste, as well as it distinguishes between several waste treatment options of different waste fractions: incineration, landfill and waste water treatment. Waste flows are calculated based on detailed national mass flow analysis including mass balances on the level of products as well as activities. In accordance with the ISO14040/44 standards on LCA and the ILCD Handbook on LCA, the model handles by-product allocation by system expansion. Versions where specific industries are represented in more detail (hybrid databases, see below) are available to order. The FORWAST database can be used both in SimaPro and Brightway2 (database access). Additional explanations are provided below on how to use SimaPro’s functions to analyze and compare products in the FORWAST database. Use SimaPro’s functions to analyze and compare products. User manuals can be found in the “Help” menu. For further guidance on how to use the functionalities in the SimaPro software, please consult the SimaPro user manual, which is included in the free demo version (under the “Help” menu). SimaPro (also in the free demo version) offers several different ways to analyse a product system and its environmental impact. Using the Calculate Network option (F10) the links between the selected process and the other processes is provided in a graphical form, see the Figure below. The Figure shows an example of a network (with cut-off 3.2%) showing important processes contributing to the 140 g CO2-equivalents from the lifecycle of 1 DKK of products from the industry “Beverage, DK” (accumulated emission values in the lower left of each box). It is possible to cut off minor contributing processes in the graphical presentation of the network. For example, in the figure above, a cut-off of 3.2% was selected to limit the number of processes shown in the diagram. The cut-off relates only to what processes are shown in the diagram, not to cut-off’s in the calculation (i.e. the underlying calculation still includes all contributing processes). The figure shows that to obtain a net-production of 1 DKK beverage, the actual (gross) production is in fact 1.08 DKK. Similar results can be found for other processes. The explanation is that not only the required output (1 DKK worth of beverage) is produced, but also beverage used in other processes of the upstream network. These feedback loops are shown by the arrows leaving at the top of the beverage industry feeding back into itself and other processes in the network. The environmentally most important inputs to a process can be found by following the thickest streams of the Figure. In this example, Grain farms are dominant, but also electricity and wholesale trade have large contributions to global warming. Other impact categories may of course be chosen, giving further information. Already from a figure like the one above it can be seen e.g. that energy processes are not very costly compared to their environmental burden; itself an interesting observation. In the example of the Figure, the electricity contributes with 10 % of the Global Warming Potential, but represents only 1 % of the economical cost of the product. Having selecting several processes in the SimaPro LCA explorer, the Calculate Compare option (F9) allows comparative presentations. The contribution from individual processes within the product systems can be shown as Tables. The results from these analysis options can be presented both as tables and figures and are of course also available for a single product. When using IO-data, it should be remembered that thay have been derived by following the monetary flows from buyer to seller. This means that services provided for free will not be included, even when they have environmental relevance. For example, the data for “Freight transport by road, DK” and “Car purchase and driving…” have inputs of vehicles, fuels, maintenance, accessories, and road and bridge tolls, but do not include the general road infrastructure since this is provided “for free” by the society, which means that it is placed under “Public infrastructure” drawing mainly on the industry “Civil engineering”. Using IO-tables as a starting point for analysing interrelationships in an economy and the importance of different product groups is known as Input-Output Analysis (IOA). When the IO-tables are supplemented with environmental data for each industry, and IOA is applied to environmental issues, this analysis is called “Environmental IOA” or “IO-LCA” are used. As a “top-down” approach it allows a complete allocation of all activities to all products. IOA has the advantage of being complete with regard to inclusion of all relevant activities related to a product. On the other hand, the IOA cannot deal with very specific questions, since it relies on a grouping of activities in a limited number of industries. This makes it difficult to use for detailed studies, such as environmental product life cycle assessment (LCA), except for very homogenous industries. Also, the necessary environmental statistics are not always available, which means that for some environmental exchanges, adequate information may be missing. Instead, LCA has traditionally been performed as a “bottom-up” process analysis, based on linking the specific processes in a supply chain. A significant advantage of such process analysis is exactly its capability for detail. However, a major problem in process-based LCA is the likelihood that important parts of the product systems are left out of the analysis, simply because it is a very difficult task to follow the entire supply chain in detail. Combining process-based LCA and IOA in what has become known as “hybrid analysis” can yield a result that has the advantages of both methods (i.e. both detail and completeness). The name hybrid analysis refers to the combination of process-based LCA and Environmental IOA. The typical (and simple) application of IO-data in a process LCA is to start from one or more specific processes that are better documented in terms of emissions and inputs than the corresponding industries in the IO data. To this “foreground” kernel, the IO data are simply added, linking each input to the process-based system with the corresponding best fitting final use group or industry output in the IO-database. Downstream processes like recycling or waste treatment may also be added. In this way, the IO data are used to complete the upstream and downstream parts of the product system not covered by specific process data. A very simple hybrid application starts from one single foreground process (for example a specific industry site), identifies in the IO-database the final use group or industry output that best covers this process, makes a copy of this IO-based process, and use the more precise data of the foreground process to replace the less precise data in the IO-based process (leaving the IO data as a proxy for those parts of the foreground data which are not adequate or complete). The resulting hybrid process may then be used in a direct comparison (benchmarking) with the original IO-based process, or it may be used in further modelling of a more complex foreground system. The advantage of this approach is that it is simple. The drawback is that there are no links back from the IO data to the foreground processes, i.e the upstream IO data do not take advantage of the added information available in the foreground processes. This also means that knowledge does not accumulate in the database, i.e. when applying the IO database for another foreground system, the added information from first foreground system is not automatically linked into the new product system. This is the main reason for the development of embedded hybrid analysis (see below), where these drawbacks are overcome. However, embedded hybrid analysis is more demanding and therefore appeals more to the advanced user that wishes to make several LCAs while continuously improving the underlying database. This more advanced hybrid approach utilises the common matrix nature of process-based and IO-based data, by embedding the process-based data in the IO-matrix. This is the approach used when subdividing industries in the IO-database as described in the project Prioritisation within the integrated product policy. The first step of this approach is identical to that of the tiered approach: The starting point is an identification of the IO-database the final use group or industry output that best covers the process for which more specific data are available. A copy of this IO-based process is then made, and the more precise data of the foreground process is used to replace the less precise data in the IO-based process. The original IO-based process is modified by subtracting the inputs, outputs and emissions now represented by the new hybrid process. In order to do this, the relative production volume of the two processes needs to be known. In the Danish database, the production volumes for the processes in the IO-database can be found as the inputs to the processes under Analyzing DK. The output of the new hybrid process is linked as inputs to all the processes that it supplies. This can be the same processes and proportions as for the original IO-based process, or it can be a different distribution when the specific process is supplying a specific segment of the market. The original supplies from the IO-based process are reduced with the amounts now supplied by the new hybrid process. Both these steps, but especially the latter, are rather cumbersome if performed within SimaPro, since every input and output needs to be accessed separately. For the advanced user, it is therefore preferable to perform these operations in the original matrix structure, e.g. in a spreadsheet software, utilising the advantage that operations in a spreadsheet can be performed on entire rows and columns. The entire database can be exported to Excel with the “Export to matrix” function of SimaPro. The two embedding steps may then be performed by adding a row and column representing the new hybrid process, performing the additions and subtractions described above, and re-import the adjusted matrix into SimaPro or any other matrix calculation tool. The procedure is illustrated in a poster from the 2005 SETAC conference. Import of matrices to SimaPro is performed via a CSV-file, which can e.g. be generated by a macro in Excel. A macro for this purpose is available to our Executive Club members. The advantage of the embedded approach to hybrid LCA is that the adjustments made will automatically be available for all future applications of the database. It is therefore the approach preferred by database developers and advanced users that perform several LCAs using the same underlying database.